Here is a picture book with a difference! Interesting facts and humor are woven into an imaginative tale about the famous Mona Lisa painting and how it was created. I sat down to read this to my eight year old daughter. She was initially unsure about the unusual layout of many small pictures and boxed text scattered over the pages. But as I started to read she became fully immersed in the story and started to relate it to her own life--things she likes to do, such as drawing and sculpting, and images she has seen before, on the walls of her Art room at school. This book is very child friendly in its organisation. The story is presented in small chunks which are easy to read. 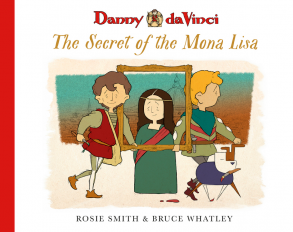 It is a great way to introduce history to children, engaging them to think beyond the book and research the life of Leonardo daVinci. The illustrations are perfect. Some images are based on original artwork by Leonardo daVinci and Michaelangelo shown in back and white, with colour images of the characters in the story. The Duke of Milan brings humor to the story and had my children giggling at his vanity. I would recommend this book to teachers and parents. It would appeal to reluctant readers with its interesting content and easy-read qualities. As a primary school teacher, this book is going straight into my teaching resources stash. This book would beautifully complement a STEAM program in the classroom, as Leonardo daVinci's life encompassed all of these learning areas with great passion. STEAM is a modern, innovative approach to learning by integrating Science, Technology, Engineering, Art, and Mathematics. There are some great teachers' notes available through the publishers' website. I would love to see this book in a larger format for presenting to groups of children. I thoroughly enjoyed this book, as did my daughter, who immediately after reading, grabbed some clay and began sculpting a masterpiece! I am inspired to plan some fabulous learning experiences for my students!